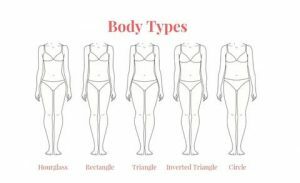 Every brides have different types of body; shapes and sizes. By the time you entered the bridal shop, you will be amazed by how many pretty gowns are there waiting for you to try them on. However, before choosing the gowns, you need to know what type of gowns will fit and suits your body. Therefore, we are here to help you find out which type of wedding dress that flatters your figure. First of all, you need to know what type of body you have. 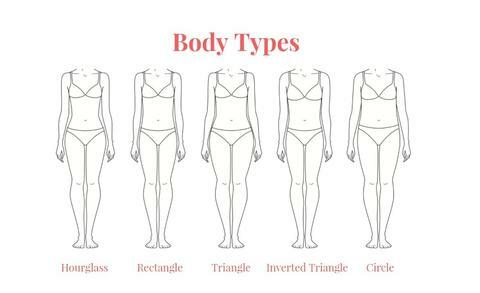 It is Hourglass-Shaped, Pear-Shaped, Apple-Shaped, Petite, Straight-lined, or Oval. 1. Hourglass-Shaped Bride: Almost anything suits this body type! Hourglass-shaped will looks really good on a mermaid silhouette; a style that flares out below the knee. Don’t hide your figure with something over sized, which will drown your curves. If you are tall, find a strapless gown with corseted back which will complement the shape of your body. If you want to look taller, find a V-neckline or one-shoulder that gives an elongating style. 2. Pear-Shaped Bride: If you have a pear-shaped figure, try to balance out your shape. You need to focus on your shoulder, bust and waist. Look for a wedding dress with a spaghetti strap, or off-the-shoulder dress that will emphasize the neck and shoulder. Look for A-Line skirt that flares out from the natural waistline, or dress that have an empire cut. 3. Apple-Shaped Bride: For the women who have apple-shaped figure, use a plunging neckline to draw attention upwards. For the skirt, find empire waistline or A-Line silhouette which will deemphasize your waist. You may also want to consider wearing a Tea-Length or knee-length wedding gown that will show your legs. 4. 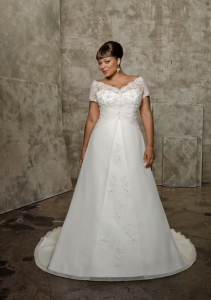 Rectangle-Shaped Bride: If you are a rectangle-shaped means your shoulder, waist and hips are about the same width. Find a wedding dress that will give an illusion of a waistline. You can wear a strapless. V-neck, or one shoulder dress to give attention upwards towards your face or wear a mermaid skirt, A-line, or empire waist dress to draw attention towards the hem. 5. Oval-Shaped Bride: What you need to find if you are an oval-shaped silhouette is a wedding dress with cowl neckline bateau neckline, scoop or V-neckline to elongate your shape by showing off your neckline. Elongate your waist by using drop waist skirt or peak empire waistline. Last but not least, don’t be afraid to try some of the consultant’s picks even though it’s something that different with what you want. Some dresses don’t look appealing on hanger but looks great on body. Book your appointment now and we will be very glad to help you pick your perfect wedding dress!